The burger chain rode a jet stream of social media chatter to hype its 100th location in Boston. 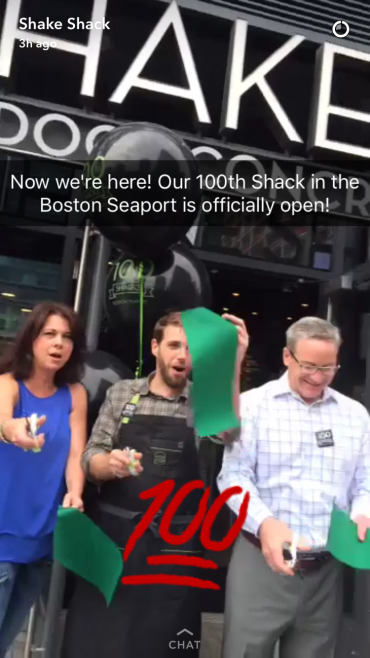 BOSTON: Shake Shack celebrated its 100th opening by holding a burger giveaway Tuesday at all its locations and promoting the event with social media and word-of-mouth marketing. Starting in Seoul, the chain opened the doors to all its locations, including the new Boston Seaport store, 30 minutes before normal business hours to thousands of customers. "We are constantly amazed with all the fans we have out there and we love making today’s opening of the 100th Shake Shack about them," said Edwin Bragg, VP of marketing and communications. "We had so much fun engaging with and talking with them across our social channels and in person in Boston and around the world to make this moment." After announcing the giveaway on its blog, Shake Shack used social channels such as Snapchat to hype the festivities in the days leading up to the Boston opening. "We don’t do any TV advertising in this stage of the brand life cycle," Bragg said. "We focus heavily on digital, social media, good old word-of-mouth, and PR, and we do some select digital and social media spend to complement our organic posts just to make sure things get seen on channels like Facebook." 44 Communications supported Shake Shack’s promotions for the milestone opening, in addition to the overall comms work it handles for the food chain. Bragg noted that the chain retains the services of several local PR firms across the country. Shake Shack started from humble beginnings as a food cart in Madison Square Park in New York City. Last Wednesday, it said it achieved $66.5 million in total revenue in the second quarter. Earnings and revenue beat expectations, but comparable store sales failed to do so. Throughout the day, employees at Shake Shack have been sharing pictures to celebrate the opening of its 100th location. "We reached out to all 100 Shacks and asked our team to express themselves on what number Shack they [work at]," Bragg said. "We got all these wonderful pictures from across the country and around the world, from one to 100. We shared them across our social platforms, Instagram specifically." Asked if Shake Shack would purchase TV ad space to grow its customer base, Bragg said, "Absolutely. Never say never. But no, we don’t have any plans at the moment for TV." 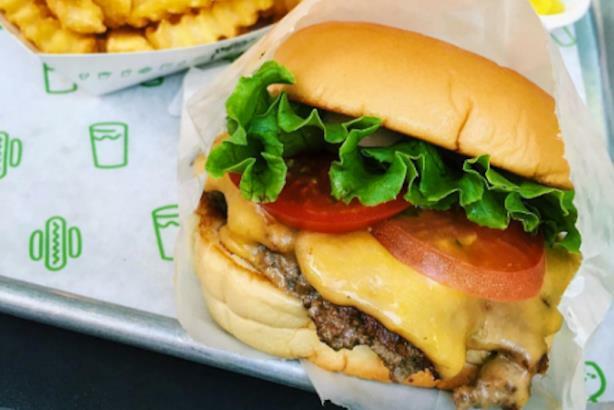 Shake Shack has also pursued unique partnerships to bolster its high-quality ingredient brand. 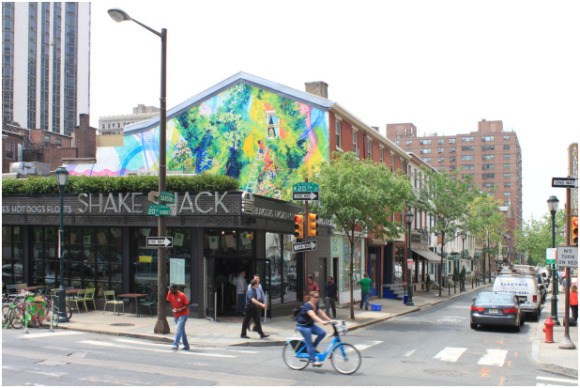 For example, a charity partner called Mural Arts created a permanent mural for the Center City, Philadelphia, location.